You Can Run a Marathon! 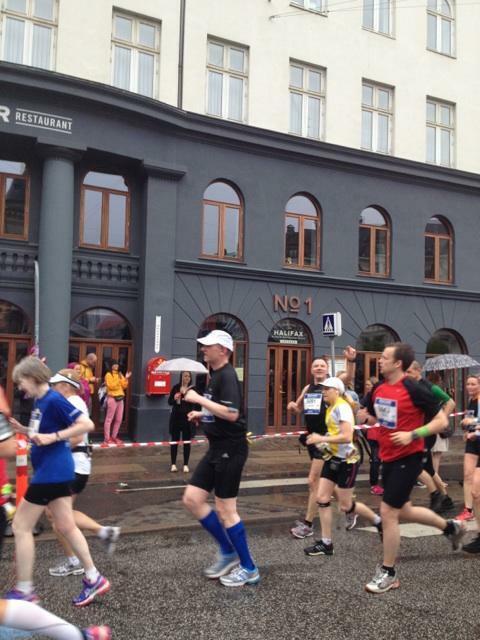 : Copenhagen Marathon 2013 Write Up! Copenhagen Marathon 2013 Write Up! After a rough few days after I finished Berlin marathon last September I said I wouldn't run any marathons in 2013 but I had a place for free in Copenhagen and no one wanted to take it off my hands so I figured I may as well run Copenhagen marathon again! My plan was to take it easy and finish sometime around 5 hours. My time was pretty good seeing as I hadn't trained for a marathon, I stopped FIVE times for the toilet (I think I took on way too much Powerade energy drink for the weather conditions), and the day before I was drinking beer and eating chocolate cake! My VERY big problem now is that because I had a fun marathon I want to run another one as soon as possible! Well I've run 5 marathons now in 2 years maybe I can make it 10 in 4 years :-) I'm looking at either Odense in Denmark (but it's a half marathon route which I'd have to then run twice and I hate repeaters), or Amsterdam marathon (I like the sound of this one and it's cheap for me to travel there). I'm standing in the toilet queue when the countdown to the start begins. The sky is looking grey but I checked the weather report just as I left home and it said cloudy but no rain for Copenhagen. What a lie that was! As the countdown gets to number 5 I start feeling little drops of rain landing on me. 10 minutes later as I pass over the start line myself (I'm following the 4:30 balloons to begin with) it begins to rain a little more. I say to the guy next to me that it's typical it begins right now. I ended up running with the guy called Carsten for the first 10k and then we kept overtaking each other as I stopped for my toilet visits. As we approached the 5k mark the rain began pouring down and that sucked. I started singing loudly that we were 'running in the rain, just singing and running in the rain'. If we didn't laugh then I'm sure we would have cried! I knew that as soon as I crossed the line later I wanted something to wrap around me before anything else. I'd learnt that lesson from Edinburgh. Anyway the rain continued and we all continued running. At 16k my friend Felicity and her boyfriend Martin were standing in the rain waiting for me with a bottle of water!! They were going to meet me again later but I said not to as it must be horrible standing in the rain. They said goodbye and off I went again. I was still feeling very good at the half way point, just wet with soggy shoes. (I'll write a review about them in a couple of days). At 24k Felicity and Martin were waiting for me AGAIN! I was so happy to see them as I really thought they had left :-) I began to feel a little tired around 26k but nothing bad. At 34k I could see the end in sight and began to feel my knees acting up a little so I slowed my pace a touch. I knew by then that I would definatly finish within the 5 hours that I had set myself. I was and still am very surprised about my time with no marathon training whatsoever. I didn't do my normal sprint to the finish as I was still looking out for my knees. I did raise my hands though! As I came over the line I looked for a foil or plastic jacket but was given a bottle of water instead. Then I saw the jackets being given out right after! So happy to get one as I was so cold by then. After the jackets came the medal which they put over my head without being asked (take note Berlin), and then I was given a single red rose. Copenhagen marathon is the only race I have run where they give out roses to all the women runners. It was a hard marathon though but mostly because of the rain and wet clothes, wet feet, and my hair dripping down my back! However I enjoyed it very much! It's a completely different experience when you have no time goal and can go at whatever pace you want to, chat and run with whoever you want to, and stop for the toilet without worrying about wasting time. I follow you time ago and i have to congratulate you. Without a specific training you run a marathon under five hours. Maybe you want to join me? Fantastic job, Lynne! I can't imagine running a full marathon in the pouring rain with wet socks, wet shoes .... but I have no problem visualizing you with a big smile while singing out loud "I am running in the rain...."
I hope you find another marathon soon and join the Marathon Maniacs. Lots of love! I have working on a plan to join you, Paul, and the other maniacs. I'll write a blog post about what I'm up to soon. Well done. Your blogs are very interesting. 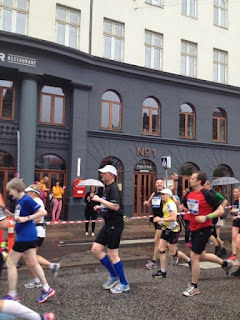 I ran the Icelandic marathon last year - it was very wet! Hoping to do the Copenhagen marathon in 2014, would you recommend it, is it flat, were there many supporters around? Got any more marathons planned for 2014? Adistar Boosts after Copenhagen Marathon Review!